The Taskbar is that bar at the bottom your screen. It's your control center for application windows on the desktop. When you start a program, a button appears on the Taskbar that lets you control that program. First I'll show you how to enter settings that will make the Taskbar more friendly. Then I'll explain each setting. Select Start | Control panel | Appearance and Themes | Taskbar and Start Menu. In the Taskbar & Start Menu settings dialog box, on the General tab, check and uncheck boxes as shown below. One of the most annoying problems with the Taskbar is that you can inadvertently cause it to move and dock to a side, or the top, of the screen. When this happens, it's very difficult to get it back to the bottom of the screen. 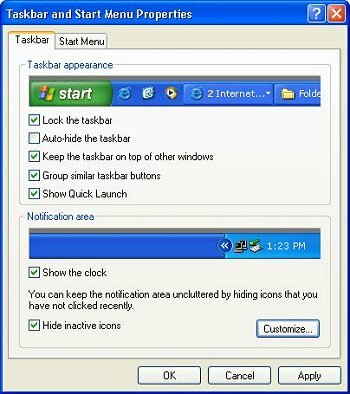 You can eliminate that annoyance by checking "Lock the taskbar". You want to check "Always on top" so that the Taskbar will not be covered by maximized windows. If you are going to be a productive Windows user, it is going to be very common for you to have several windows maximized at the same time. You will be switching between those windows by clicking on their icons on the Taskbar. Why would you want the Taskbar to keep hiding? Make sure "Auto hide" is unchecked. Make sure "Show Clock" is checked. Of course, you want a clock on the Taskbar. In another article, I'll show you how to get a Calendar and Calculator on your desktop as well.